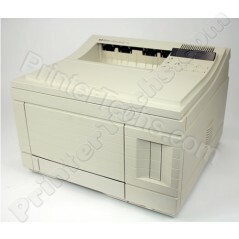 This model is a very reliable, classic mid-sized workgroup or personal laser printer. 12 pages per minute, 250-sheet paper tray. The HP LaserJet 4 Plus is a classic mid-sized workgroup or personal printer. You get a lot of printer for the money. These babies were built to take-a-lickin' and keep on tickin'. To find this kind of reliability in a new laser printer you would have to spend two to four times the money. This model features 12 pages per minute, and a 250-sheet paper tray. 11.7" x 16.3" x 15.8"